It only takes one of our city's flop-sweating, smog alerting summer dog days to remind me what an amazing meal pho really is since it's probably one of the last things I want to eat on an afternoon when Toronto's channeling Ho Chi Minh City's smoggy spirit. Despite its improbable origins, I'm eternally grateful for that meal-in-a-bowl from the tropics cos, really, what goes better with blizzard than this week's best bowl of beefy, noodle-y, soupy Vietnamese goodness? And how better to forget about the current frigid lows than by tucking into a steaming bowl of soup at Que Ling? It's a setting that feels as real-deal (minus the snow, natch) as any mom-and-pop Saigon soup shack. As long as it's open that is, which is never a sure thing. Provided you can even find the restaurant tucked away on a residential side street south of Gerrard bustle (recent signage updates seem to be a concession to intrepid first-time patrons who no longer walk past mistaking it for another ramshackle residence) it's a rare evening indeed where you aren't greeted by darkened windows and locked doors by 7 pm. But on afternoons that you're lucky enough to find your way in from the cold to a table amid the local colour, Viet cinema posters and day-glo walls you'll enjoy an exceptional bowl of beef noodles. And for me, just such an occasion recently presented itself. There are one or two occupied tables this lunch hour and as usual the wait staff are exceptionally welcoming and courteous, flashing huge smiles and making you feel at home. The pride they have in their establishment is clear. Our orders are taken promptly and within five minutes out comes our entire order: 2 steaming bowls of noodle soup and an order of spring rolls. There's an abundance of TLC evident in the well balanced stock that serves as the base for the Pho Dac Biet (Que Ling Special Noodles, $6 medium). This soup positively screams homemade with its signature sweetness and a little more clove than your typical bowl of noodles. From a handed down recipe and like no other pho in the city, Que Ling's soup reveals a complexity that makes every spoonful slightly different from the last and that'll have you excited for the very next spoonful as well. 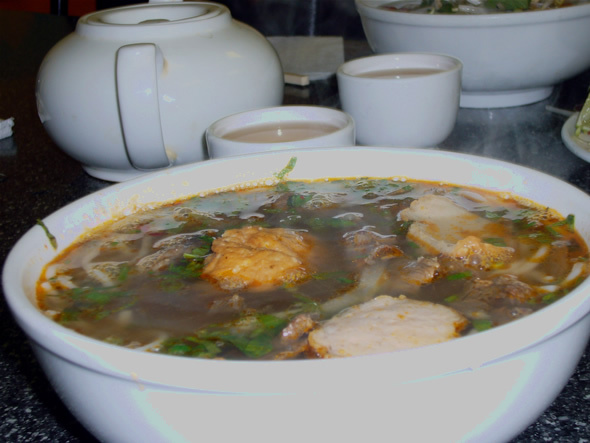 The beef, tendon and tripe, lovingly cooked and finished in the soup are all toothsome, offering a variety of textures and serve the flavourful soup well. In contrast, the Bun Bo Hue ($6 medium) is a slight disappointment and feels like the ugly stepsister to the beef pho's Cinderella. Far from terrible (the yummy spicy flavour and chewy texture of Vietamese pork sausage is a definite highlight) it simply lacks the other soup's sultry complexity which might be forgiven if it possessed even a bit of the fiery punch I'm used to from other local examples of Hue style noodles. The noodles themselves (round and spaghetti-like rice stick as opposed to the customary flat rice noodles found in pho) are lacklustre, sparse and difficult to pick up with the chopsticks. Fortunately, Things get back on track with some of the plumpest, garlicky spring rolls ($2 for 2) the city has to offer. Slightly smaller than the average they make up for it by packing a real flavour punch that'll make you want to order seconds! 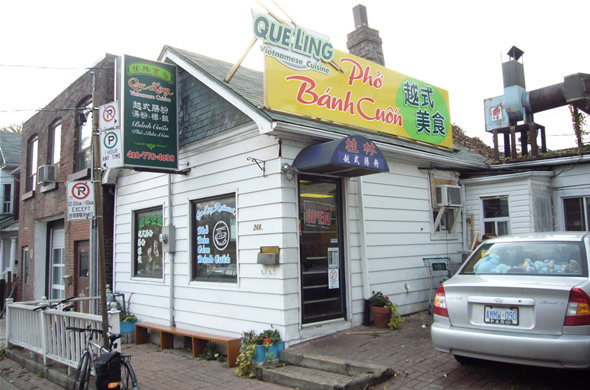 Sure Que Ling is hard to find but some of the best food destinations in the city lay slightly off the beaten track. It's worth the effort to warm yourself with some cheap and cheerful Vietnamese cuisine in low-key, authentic digs on a chilly pre-winter afternoon. You'll definitely be treated like family when you go--just don't be late for dinner.